Considerations for covers for series aren’t really so different from any book except that an author and her cover artist must consider whether the elements can be sustained and there are several ways to do that with the cover. One of the most sustainable elements of marketing a book series is the author’s name. New authors and artists without special training in book cover design often under emphasize their own name. I tell them to look at the books in the window of Hudson’s bookstores in airports. The authors’ names are huge. The authors’ names are sometimes gilt. The authors’ names are often embossed. That’s because (you’ve heard this before from me in my multi award-winning book, The Frugal Book Promoter), an author’s name is her true brand. Or soon will be. And an author planning a series is even more dependent on his or her own name for recognition and identification than most. In addition to the size of the author’s name, authors of book series should consider repeating its position on the cover, using the same solid—very bright—color, that metallic look, embossing if the publisher can afford it, or all three. The font should be repeated, too—preferably one that’s identifiable even if only subliminally. Of course, it’s the overall look of the cover that interests most authors and that brings up genre. All the elements of all the covers in the series must evoke the genre. This is one time that being super-original may not be best for sales. The look must suggest to the reader exactly what he or she will find inside the book. Think Picault’s images for Danielle Steele’s books. They catapulted him to fame in the world of fine art. Internationally known Park West carries his originals and prints even after his death. We may not be able to name him on sight, but we know it’s his work when we see it and that when they appear on a book cover, they are Steele’s books. To evoke a feeling of familiarity among readers usually means using the same artist on each of the books in a particular series—perhaps even across different series. Note: Consider negotiating with your artist that he or she will do book cover art only for your series. This probably will require a renewable stipend for exclusivity, but it may be worth it. These are all considerations for series written by nonfiction authors, as well. Notice the unique font/art developed by Chaz DeSimone (http://DeSimoneDesign) for my HowToDoItFrugally series. Those coins say something visually and they are memorable. It’s not always possible to be that creative, though. Chaz said my frugal titles were like the perfect storm. Everything came together for inspiration. But that’s still possible, even without that once-in-a-career brainstorm. Consider the famous Dummy series. In addition to carrying through a specific, very bright contrasting color scheme (yellow and black). These books also all place logo in the same place on every cover (I plan to talk about logos later in this book to be published in 2018). Consistency in image placement is important, too. In the Dummy books, they use realistic images-- usually actual photos or true-to-life illustrations. The Dummy graphic designer knows that the font is still important. He or she uses two fonts in the titles and both have a kind of do-it-yourself character. “Dummies” is in every one and connotes a small child’s first approach to printing without using too-obvious backwards letters or mixed caps and lower case. The other part of the title very simply tells the reader what he or she will learn. Word. Home Buying Kit. Mortgages. And because it slants right in a sort of italic look and is black and white, it evokes a chalkboard and—once again—a new learner. These cover took a lot more thought than is at first apparent. There are other tricks for books in series, too. The visual can be maintained throughout a series in a geometric shape—a circle, oval, triangle. By using blocks of color that repeat themselves. We mentioned overall color schemes in the analysis of Dummies. Obviously much will depend on an author’s publishing situation. When an author is traditionally published he may have very little control over his covers or none at all. Still—if possible, he should let the designer know the genre, his preference for an artist or style, and that it will be a series. That means that he must work to work as a partner with the designer and the more he knows about covers, the better partner he will be. Note: If your book lends itself to using a reproduction of a famous painting in the public domain, put that idea on your list to consider. It has been shown that these images increase how well a reader remembers the cover, title and content of a book. One thing the author will usually have complete control over is the size (thickness or page number) of her books. If one is very fat and another very slim, much will be lost in terms of a cohesive brand. As you can tell, I am big on using the author’s name as a major design element, but there are times when the emphasis may best be put on another element of the cover. Sometimes it’s hard for an author to be open to something different from their first concept. Many authors fear looking too commercial or are very shy and loathe the idea of making their name the main design element. Many authors have an artist they want to feature (a mother who does water colors or uncle who does killer charcoals). That would be nice and personal, but if it doesn’t fit the topic, they should be open to rearranging their demand. Beyond the basics, I believe in giving the most professional designer you or your publisher can afford full reign to allow her creativity to shine. Sometimes it’s easier to make suggestions and fine tune afterward, anyway. 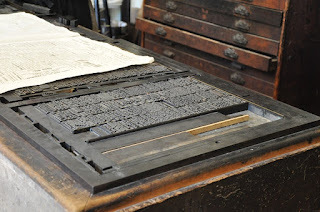 After you and your designer have settled on the look of your cover, you want to carry the branding sensibility you’ve begun to the interior of your book. Many graphic designers can help you with that, too. And you’ll want to keep all of this branding you’ve done in mind for the entire marketing campaign. A prissy, wedding like launch party with canapés doesn’t cut it for a series on caring for your car. Note: If you are self-publishing and have decided to use a template like those provided by Createspace, be very careful to choose one with a structure that is most likely to be carried though for the entire series. 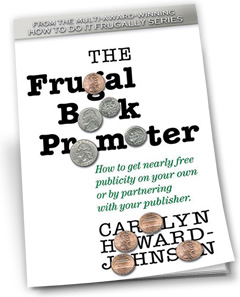 in my HowToDoItFrugally book series, The Frugal Book Promoter: How to get nearly free publicity on your own or partnering with your publisher (http://bit.ly/FrugalBookPromo). If this is your first book in a series, your campaign will grow as your plan—even if you are one of those who maps out the campaign carefully. A good map, though, will help you avoid having to make too many corrections as you go. That is both smart and frugal. Note: Before making your final decision, reread the chapter in the flagship for of my #HowToDoItFrugally Series of books for writers, The Frugal Book Promoter. There you will find what you need for writing the copy for our book’s back cover like the mini biography, the oft-ignored (sadly!) second subtitle, and the pitch or mini synopsis. This may be an area that you are better at than your designer, though many graphic artists or cover designers who have lots of experience with books are also excellent copywriters and marketers. So do ask for advice and listen to the answers. This article is destined to become part of Carolyn Howard-Johnson’s fourth book in her multi award-winning HowToDoItFrugally series of books for writers set for 2018. 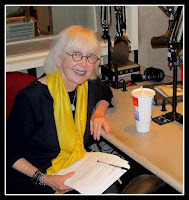 It will have a foreword written by her book designer Chaz DeSimone and the frugalish coin design of the How to Get Great Book Reviews Frugally and Ethically (http://bit.ly/GreatBkReviews) where you will learn Carolyn’s secret to getting review from big journals by going through the back door and how to use reviews to access commercial catalogs. Learn more about Carolyn including her poetry and fiction at http://howtodoitfrugally.com where you can also see some cover designs for her series of poetry books that were courtesy of free templates offered by Createspace.com. Carolyn, what great information on creating memorable book covers for a series. I hadn't thought about all the detail that must go into designing just the right cover. Carolyn, as always you have offered thorough and spot-on information on book covers, advice that can be used even for stand-alone books. Since I am just now beginning a series I will take your information to heart and carefully consider your advice. Thank you for the terrific help.